Abstract: Open water features, both natural and anthropic, for King County and portions of adjacent counties. Features can be displayed as water or non water to distinguished between water and land. FEAT_TYPE item defines multiple classes of features, primarily lakes/ponds and streams rivers. 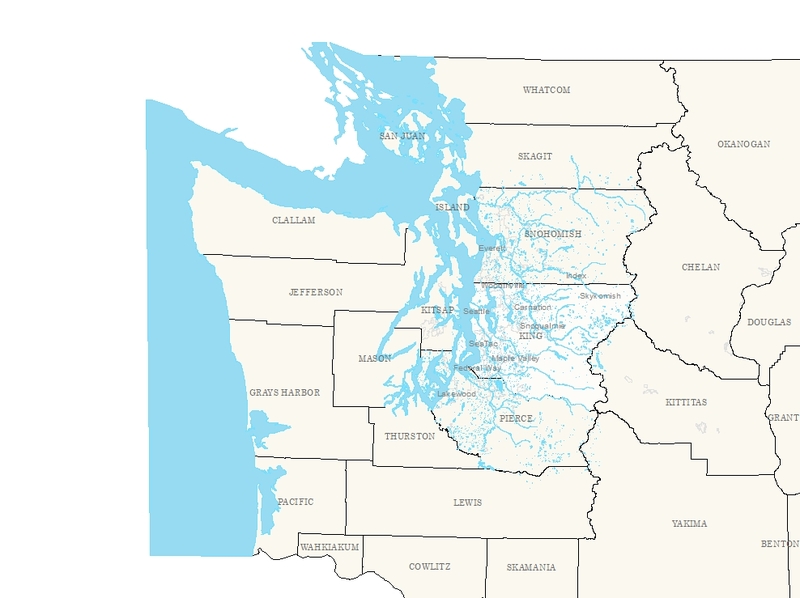 Puget Sound and significant double-banked streams and rivers are shown, plus a limited number of manmade features such as aqueducts, ditches, channels and flumes. Areal open water features are mainly differentiated as either Lakes/Ponds or Impoundments roughly defined as natural and anthropic, respectively. The name of features, where available, is included. By using the SUBSET item the layer can be defined to show only the larger water bodies and rivers. Supplemental Information: Previous editions of this layer also produced a separate BIGWATER layer where the major feature subset was created as a permanent layer. This is no longer created. 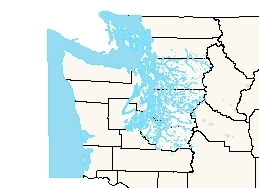 King County shapefile users can perform a definition query on the SUBSET item, or depend on the WTRBDY_AREA_BIGWATER.AVL legend. Geodatabase featureclass users can also perform a definition query, but may also use the WTRBDY_AREA_BIGWATER.LYR file found in the Plibrary LYR library. Overlapping and some multipart geometry has been removed from this version of WTRBDY in order to simplify its use and display. 1. The tidal line (high-low tide) has been removed from Puget Sound. This information is still available in WTRBDY_DET_AREA.2. Marine islands have been removed completely. If needed these can be found in WASHSH_AREA or KINGSH_AREA which are re-derived each time WTRBDY_AREA is updated. 3. Fresh-water islands are erased from double-banked streams allowing the position of the islands to be determined and for underlying topography to show through. This eliminates the occasions where the islands were previously hidden due to overlapping geometry. Fresh-water islands can still be displayed by querying for this feature type in WTRBDY_DET_AREA or by using the customized LYR file called WTRBDY_DET_AREA_ISLANDS.lyr4. Feature type 406 (Dam, wier, or obscured) that overlap water are also erased. This eliminates some unintentional hidden affects, but primarily improves the display along built-up harbor areas. With these features erased from the water, the fit between current orthoimagery and the egde of water is better. This feature type can also be found in the the ISLANDS customized LYR file described above. The overall intent of these changes is to remove man-made and land features from WTRBDY_AREA to increase the emphasis of this layer as water-only. Bigwater river A significant double-banked stream or river that is part of BIGWATER cartographic set. Bigwater waterbody A significant lake or pond that is part of BIGWATER cartographic set.